Our flagship products are our Diskeeper record sleeves, the highest quality phonograph record sleeves available anywhere. Our outer sleeves pioneered the use of polypropylene, combining the crystal clarity of Mylar with the low price of polyethylene, without Mylar's tendency to split. We also have a full line of inner sleeves made with antistatic HDPE, and make sleeves for 7", 10", and 12" records. Don't be forced to choose between keeping the original packaging of your picture disc singles and upgrading to an anti-static HDPE sleeve--now you can have both. 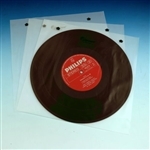 These smooth, perfectly fitting round bottom 7" inners will glide easily into picture sleeves without protruding or crumpling. Strong, soft, and inexpensive, these sleeves are a significant upgrade from traditional paper--no static, no dust, no possiblity of scratches. These inners will make sure your vintage 10" records last a lifetime--and beyond. Your 7" records deserve a truly exceptional sleeve, like our 7" Diskeeper, made of silky smooth and extremely tough anti-static HDPE. Never brush paper dust off your records again! The 7" version of our 2.5 mil Ultimate Outer will keep your 45 rpm singles and their packaging clean, dry, and safe, and the ultra clear material allows artwork to pop without the gray haze of polyethylene.